Last week the ABC here in Australia broadcast Hugh Piper and Helen Barrow’s documentary, “Dancing with Dictators“. It deals with the characters behind The Myanmar Times and particularly its larger-than-life Editor-in-Chief Ross Dunkley. Dunkley had a tough 2011 where he spent almost two months behind bars as a range of personal, commercial, political and criminal disputes were resolved. The documentary is a terrific introduction to one of the most fascinating parts of modern Burmese society: the media. And it is remarkable, and very notable, that Australian accents have such a prominent role in the evolution of newspaper reporting in the country. Dunkley is a polarising figure and over the years has no doubt made many enemies. But in the documentary he comes across as a quirky and likeable guy. Prone to bold ambitions and big dreams, he has carved out a place in Burma’s media history. This interview gives a good sense of his current take on matters. And if you compare recent editions of his newspaper to what was published even 18 months ago then the transformation is startling. See this November 2011 New Mandala post for just one small example. My only hesitation with the documentary is that the timing of its broadcast in February 2012 is a bit unfortunate. Hundreds of thousands of Australians will have watched its account of life in Burma and wondered whether all they have been hearing about political reform and increased open-ness can be believed. What isn’t made clear enough is that the 2010-2011 snapshot is real. But it is also true that since then, since the film-makers were kicked out of the country in November 2010, things have moved on. 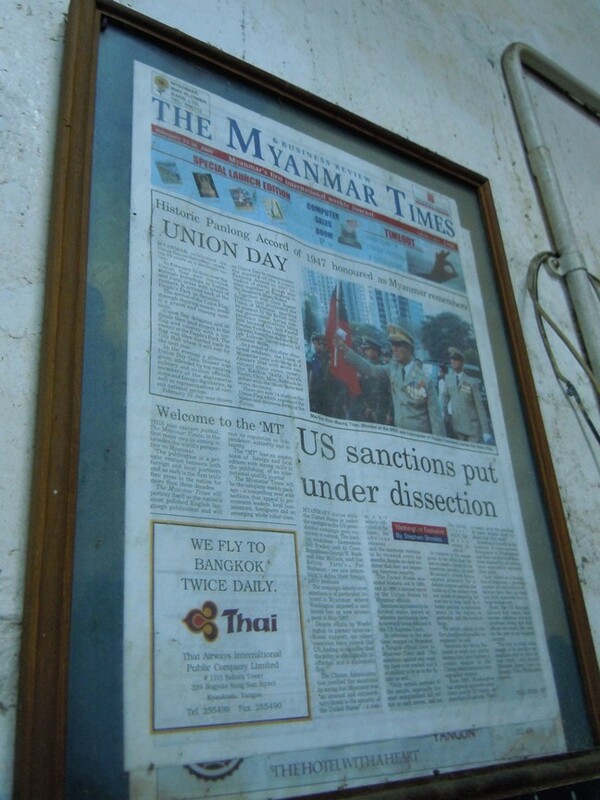 Perhaps one day Piper and Barrow wll be in a position to make a sequel; perhaps once The Myanmar Times is up-and-running as a daily newspaper. I’m sure any follow-up would be another commendable contribution to our understanding of Burma’s media landscape and would be a further sign of the changes that are sweeping the country. It would also be some compensation for the shabby deportation that the film-makers experienced the first time around. Dunkley definitely didn’t seem quite himself being so “quirky and likeable” as you said.. Hopefully we will see more of that side of him in the future. Sounds like he does his job well, stirring up debate 🙂 Excellent. Thanks for wonderful article.